Below is an essay by Professsor Paul Atkinson from the Cardiff School of Social Sciences at Cardiff University and relates to our sciSCREENing of Der Golem in October. At almost the same time as the film was being made, another version of the golem myth was being transformed into a modern art-work. Nicolae Bretan composed a one-act opera on the topic in 1923. Bretan was the first composer of Romanian opera, being of Transylvanian origin. Based on a poem by Mihali Eminescu, ‘The Ghosts’, the opera is yet another version of a European Jewish myth that has a long history and exists in many transformations. In the opera and the poem, the focus is much more intimate than the film. It concentrates on Rabbi Löw, his grand-daughter Anna and the Golem (whose creation precedes the action). 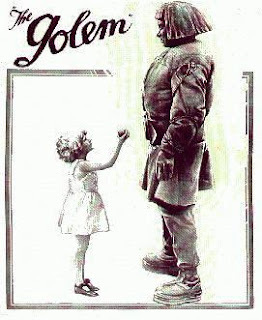 The Golem is in love with Anna, whom he has touched and kissed. She is now gravely ill, as the touch of the man of clay is fatal. The Golem confesses his desire, and begs the Rabbi to give him the remaining power he lacks – the power to procreate. To save Anna’s life, the Rabbi kills the man of clay, ripping from beneath the tongue the fragment of parchment that has hitherto animated him. The opera provides an interesting version of the myth. The Golem himself is the tragic hero of the piece. He and Anna represent two alternative creations of the Rabbi. The Golem’s inability to procreate mirrors the Rabbi’s own creation that itself denies life. It also reminds us that whatever the detail of any given version, the ‘monster’ is always incomplete in some vital way. In general the Golem is a very variable creature. In some versions, it is a comic figure – clumsy but not malign. In others, it runs out of control like the sorcerer’s apprentice. In the film we see both sides of the man of clay – a helpful domestic helper, rather engagingly doing the shopping, and then out of control, creating mayhem and death. Visually, there are some important parallels with the early Frankenstein of James Whale. But the underlying mythology is very different. The Frankenstein ‘monster’ is created out of science: The body-parts are those of the anatomy schools and their grave-robbers. They are animated by galvanic force – one of the key elements to animate science of the romantic period. The Golem is animated by the word, or more accurately the text. In many versions (as in the opera) it is a word written on parchment. In others (as in the film) it is an amulet inserted into the clay. This representation of esoteric knowledge is diametrically opposed to the science of Mary Shelley’s Creation. Both versions, of course, give us a vision of an imperfect, incomplete, creation that embodies and yet escapes the creator’s desires. In both, the creature is pathetic rather than horrific. The Golem adds another dimension to the abjection of the creature: by virtue of its Jewish origins, the creature and its creator are both ‘other’, and both need to be controlled – walled up and secluded in the ghetto. When the Golem breaks out of the ghetto walls, it is after all to a world of Christian imagery and blonde children. It is not, I think, necessary to search for specifically anti-Semitic sentiment here to recognise how the Jew stands for an orientalised alterity. Hence the Jewish creature is doubly monstrous.